I’m definitely having a bit of a love affair with socks at the moment. 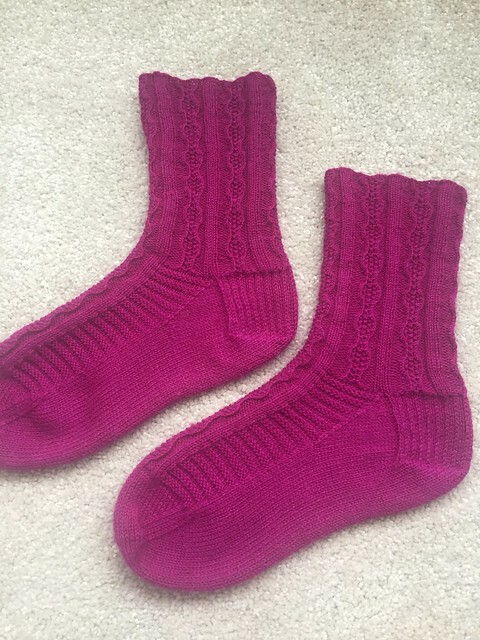 These guys were cast on a week or so after finishing my Hortensias, and in fact this post was almost a twofer because yesterday I finished a pair of Twyllas (but have decided that they warrant both a) blocking and b) their own post, because they’re awesome – there’s a little preview down below for anyone impatient). Three pairs in two months is a wild new high for me – I’m not sure I’ve managed even two pairs in the same year before. The link, keenly observant readers might have noticed, is that they’re all CoopKnits patterns. 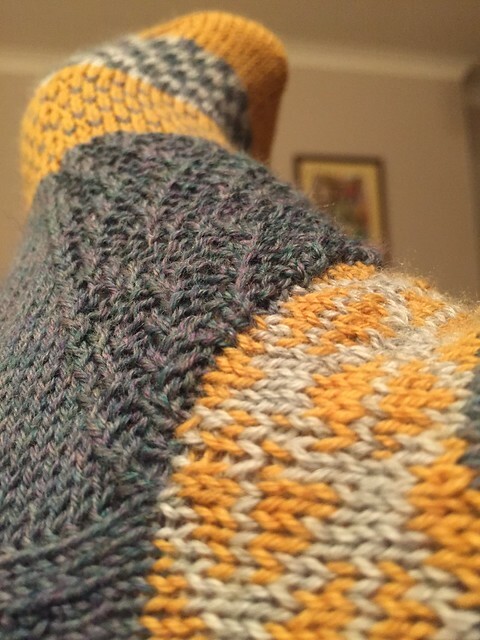 I am having a lovely time working my way through vol I of Socks Yeah!, basically (and I almost, almost cast on for a fourth pair yesterday, before deciding that my neglected Driftwood needed some work first). Right, I’m wandering off topic. This is a pair of fuchsia Linneas. They are VERY PINK, very structural, and I’m very pleased with them. I dug into my stash for this yarn, which was a secret santa present at work a year ago. It’s not a fancy-pants sock yarn, it’s a basic workhorse yarn from Tiger (which is not known for its exotic knitting-related wares, as far as I know). It’s 75% non-specific wool and 25% nylon, which is perfectly appropriate for socks. And you know what? It knits up just fine. 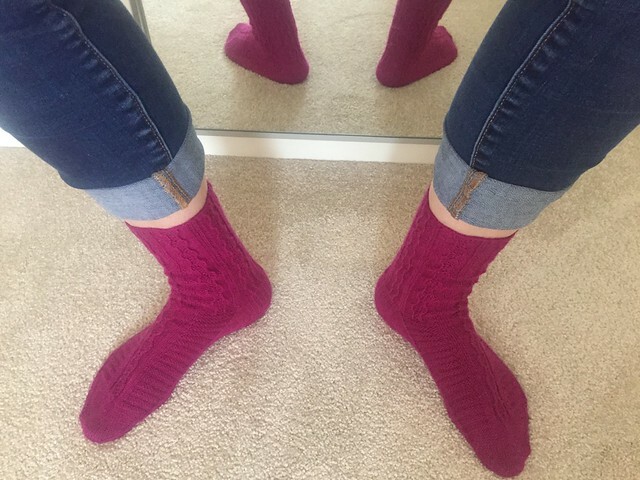 It was a little scratchy to work with but after blocking the socks soften up nicely and I can already tell that they’re going to be good and hard-wearing. Well done, Tiger. 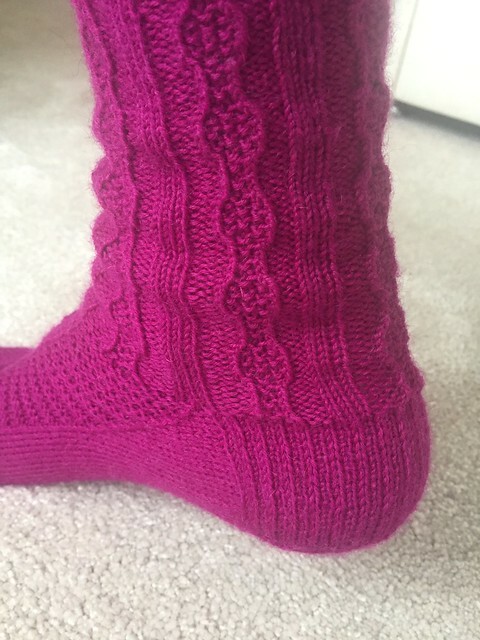 The pattern caused me a few gauge issues – there’s a lot of twisted stitches which means it’s less stretchy than the lace Hortensias. So I experimented, and cast-on for the medium size (72 stitches around) while using 2mm needles. 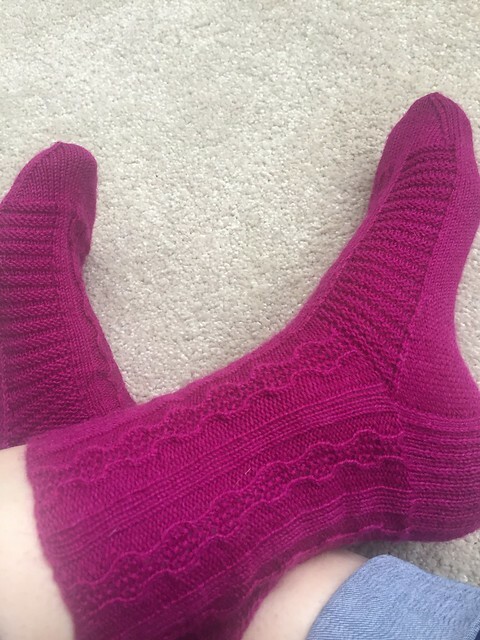 The only mods I made were to do an extra pattern repeat on the leg and to do two extra rows on the heel. And the experiment paid off – they fit perfectly. Yay me. I like them a lot – they’re form-fitting and interesting to look at. 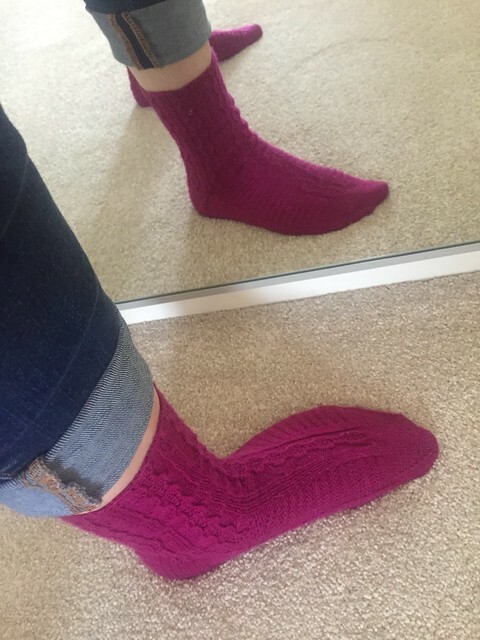 Definitely another CoopKnits win (she’s a clever lady). And here’s a sneak peek of the Twyllas I finished yesterday. They are ace so expect a post on them very soon. Thank you for reading! If you enjoyed this post then please use the buttons below to share, like, or leave me a comment.